Besides water and essential nutrients, one of the most important things a young tree needs is support to grow. By helping the tree stand tall, you can prevent it from bending and growing crooked. Supporting the tree will help it grow tall and straight. One of the most popular methods of helping a young tree grow straight and tall is to place long stakes into the ground on either side of the tree and tying them together, making loops around the tree. The loops you make around the tree should be fairly loose to allow for the trunk of the tree to expand. Staking a tree can help prevent wind and other forces from moving the ball of roots within the ground, giving the tree a chance to grow a stable base into the Earth. 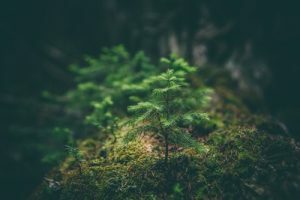 The most devastating thing that can happen to a young tree is to have movement before it has had a chance to properly plant its roots firmly in the soil. Before you stake a young tree, be completely sure that it needs it. You do not want to constrict the growth and movement too much, which could cause damage beyond repair. For example, the material you use to stake the tree could cause abrasion on the trunk. This may happen anyway in nature, but why have it happen needlessly? The process of staking your young tree is rather simple. Just take three stakes and tie each one separately near the base of the tree. An even better option is to use a sort of tether to prevent potential rope burn on your tree. Materials can be purchased at any gardening shop or home improvement store. The goal is to minimize the friction from the rope that the tree endures. When the tree has been staked long enough to stand on its own and its roots are secure, you should remove the stakes. Keeping the tree constricted may cause it to lose some of its vitality. You may even want to check your local weather report to be sure there are no storms or high winds coming in that could harm the tree. You should always be sure to stake a young tree that needs the extra support to give it the best chance to grow tall and strong. However, staking a tree that doesn’t need it can be just as damaging as not staking a tree that does need it. If you’d prefer to consult an arborist, we’d be happy to help you. Give us a call at 914-238-0069 and we’ll assist you in recommending the best trees to plant in your yard and how best to maintain them. This entry was posted in Tree Care on October 20, 2017 by Westchester Tree Life.